Cells are made up of diverse and interconnected signaling networks that control every aspect of cell function and physiology. These signaling networks are able to respond to various cues, either extrinsic (e.g. growth factors and hormones) or intrinsic (e.g. cell metabolism). In doing so, various aspects of cell physiology such as proliferation, growth and migration are modulated in response to these signals. Disruption of how these cell physiology processes are controlled by extrinsic or intrinsic cues contributes to and drives the progression of diseases such as cancer and diabetes. 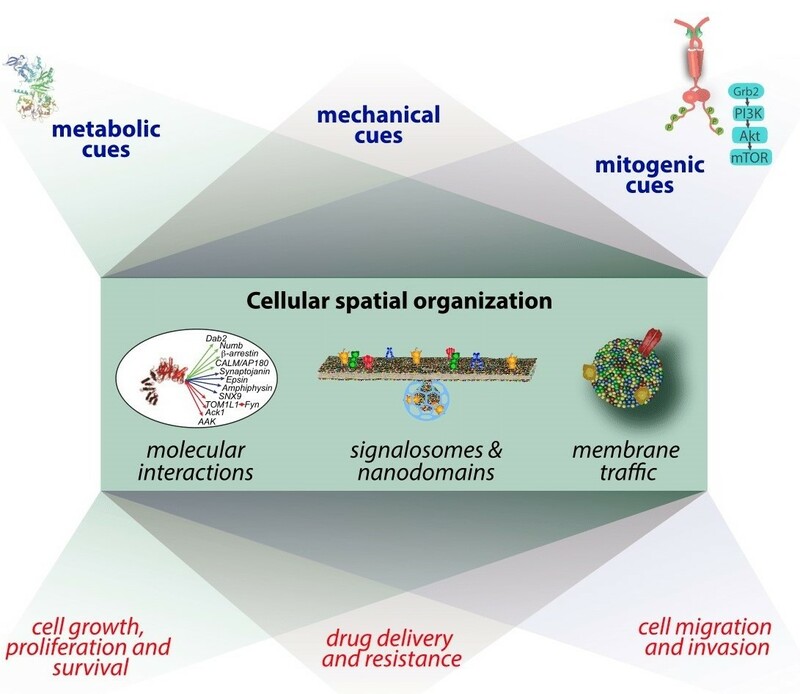 We are interested in understanding how cells sense and respond to various cues, including chemical cues such as growth factors, mechanical cues , and metabolic cues , to lead to regulation cell proliferation, growth and migration (Figure 1) . Moreover, we aim to understand how these processes can be therapeutically exploited for the development of new cancer drugs and new strategies for targeted drug delivery, as well as the identification of new cancer biomarkers. We are focused on understanding how chemical, mechanical and metabolic cues impact various molecular assemblies inside cells, starting with protein-protein interactions that in turn lead to formation of transient and dynamic plasma membrane microdomains and signaling platforms, and how these in turn control membrane traffic, in particular the process of clathrin-mediated endocytosis, and receptor signaling, in particular that of the epidermal growth factor (EGF) receptor (EGFR). Figure 1. Overall research interests of the Antonescu lab. We are interested in studying the regulation of dynamic nanoscale molecular assemblies, signaling processes and membrane traffic by various intrinsic and extrinsic signals, and how this regulation contributes to control of cell physiology, including cell growth and proliferation, and migration. Further, we aim to develop strategies to therapeutically modulate these phenomena, such as to achieve targeted drug delivery. Control of receptor signaling by plasma membrane clathrin structures. Receptor tyrosine kinases (RTKs) are a family of 58 receptors that control cell proliferation, survival, migration and invasion. We focus on study of the epidermal growth factor receptor (EGFR), which drives progression of several types of cancer including triple negative breast cancer, non small cell lung cancer and glioblastoma multiforme. Upon binding EGF, the EGFR undergoes autophosphorylation and activation of a number of intracellular signaling pathways, including phosphatidylinositol-3kinase (PI3K)-Akt and Ras-mitogen activated protein kinase (MAPK) that mediate the control of cell physiology by EGFR. Many of the receptor-proximal signals are activated at the plasma membrane. Concomitantly to activation of receptor-proximal signaling intermediates, EGFR is recruited into clathrin structures at the plasma membrane. Clathrin, together with ~50-100 other proteins assembles into 50-200 nm structures associated with the inner leaflet of the plasma membrane. Some of the clathrin structures at the plasma membrane are clathrin-coated pits, which mediate the internalization and eventual long-term downregulation of EGFR. 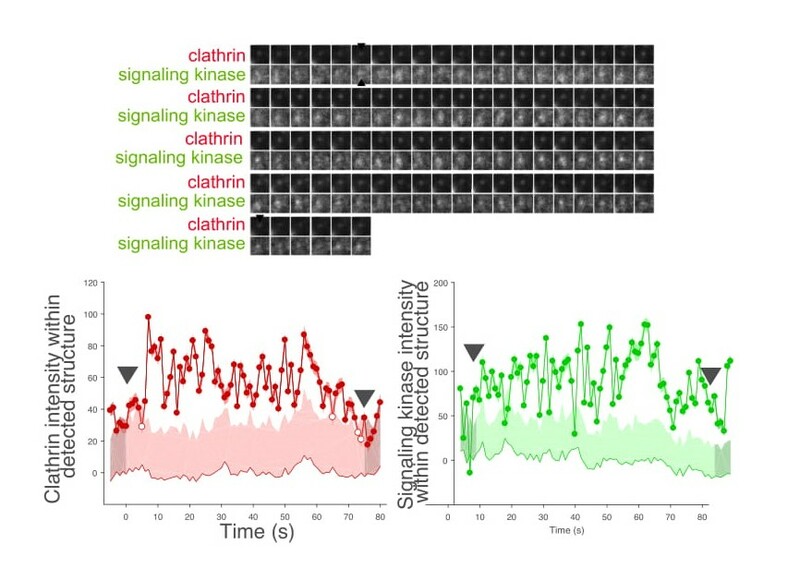 We have discovered that plasma membrane clathrin structures have an additional function at the plasma membrane that is either distinct from or precedes receptor internalization ( Garay et al, MBoC, 2015 , Lucarelli et al. Commun Integr Biol. 2016) . 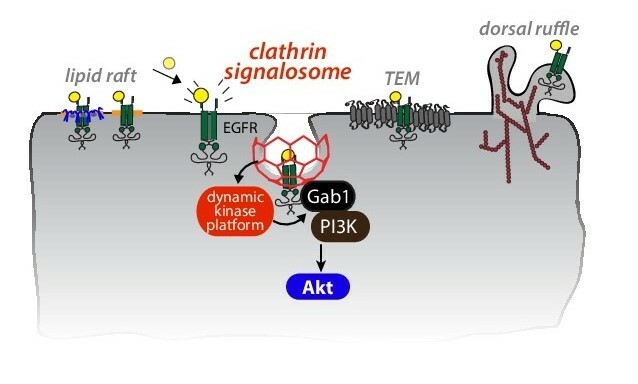 Perturbations of clathrin impaired EGFR signaling leading to Akt phosphorylation. Importantly, perturbation of the GTPase dynamin2, which allows EGFR recruitment into clathrin structures but blocks receptor internalization, did not impact EGFR signaling. Figure 2. Regulation of receptors by clathrin signaling domains. We are studying how plasma membrane clathrin structures, which we term clathrin signalosomes, control signaling of certain receptors such as EGFR, by acting as dynamic platforms for the recruitment of key kinase(s) and other signaling regulators. We thus proposed that some plasma membrane clathrin structures form signaling-specialized structures that we term clathrin signalosomes (Figure 2). These clathrin signalosomes are required for EGFR signaling leading to Akt phosphorylation. We identified that phosphorylation of the adaptor Gab1 by EGFR is the most upstream clathrin-dependent signaling event, and suggested that clathrin signalosomes control EGFR signaling by dynamically scaffolding specific kinase(s), allowing spatiotemoral connection of the signaling circuit from EGFR to downstream intracellular intermediates. We have also identified that the clathrin structures in which EGFR resides are unique and specialized (Delos Santos et al, MBoC, 2017). EGFR is found in plasma membrane clathrin structures that are distinct from those containing other receptors (e.g. transferrin receptor). Furthermore, the clathrin structures that contain EGFR (including clathrin signalosomes) are uniquely regulated by calcium signals. As such, clathrin structures such as signalosomes represent important platforms sensitive to multiple signaling cues and inputs, and thus represent a core node in cross-talk between different signaling pathways and systems. Figure 3-A. Study of signal molecular dynamics. We use various forms of microscopy coupled to automated image analysis of cells expressing fluorescently-tagged scaffolds and signaling proteins to uncover the dynamics and nanoscale spatiotemporal organization of signals at the plasma membrane. Shown in (3-A) is a time-lapse of cells expressing fluorescent clathrin (red) and another signaling protein (green), with computer-based detection and tracking of structures as per Aguet et al. Dev Cell 2013 overlayed. Figure 3-A. Shown in (3-B) is a representative dynamic structure harboring both clathrin and this signaling protein. (iv) How clathrin structures contribute to cancer cell growth, proliferation and drug resistance. To do so, we use various forms of total internal reflection fluorescence (TIRF) and super-resolution microscopy, and single-particle tracking of EGFR coupled to automated image analysis (Figure 3) to detect, track and analyze clathrin signalosomes, receptors and signaling molecules. (v) Furthermore, using various cellular and in vivo models, we aim to identify how clathrin signalosomes contribute to tumor progression and to the development of resistance to existing drug therapies, focusing on breast cancer. Dynamic control of the cell surface proteome by cell metabolism. All cells interact with their environment through proteins present on their outer surface. The dynamic localization of each protein to the cell surface is critical in regulating its function, as the extracellular milieu contains soluble ions, nutrients, hormones, and adhesion sites. Cells must specifically and rapidly regulate each cell surface protein to adapt to changing needs in order to maintain homeostasis and ensure survival. There are a large number of metabolic pathways and systems within cells. Given the critical importance of many of these metabolites to cell physiology and survival, cells must be able to sense changes in flux and availability of various metabolites. In the event of scarcity of specific metabolites or altered metabolic flux, cells must be able to rapidly engage specific signaling responses that can ensure cell survival during the period of metabolic insufficiency, and in some cases engage in long-term cellular adaptation. Figure 4-A. Metabolic stress and AMPK regulate cell surface protein membrane traffic. (4-A) Diagram of endomembrane traffic, showing clathrin-mediated endocytosis, sorting and recycling. We aim to understand how AMPK and other metabolic sensors regulate these phenomena, focusing on clathrin- mediated endocytosis. One of the most critical metabolic molecules is ATP, which undergoes hydrolysis to facilitate a wide range of catabolic reactions in the cell. Metabolic stress in the form of reduced ATP availability (i.e. an increase in AMP:ATP ratio) triggers activation of AMP-activated protein kinase (AMPK). Once activated, AMPK triggers activation of many signals, generally leading to either energy conservation (restraint of anabolic pathways) and increased nutrient uptake or catabolism. Central to both of these processes are cell surface proteins, many of which control some of the most ATP-demanding cellular processes such as establishment of membrane potential and cell migration. Yet other proteins of the cell surface are responsible for the uptake of specific nutrients such as glucose and amino acids. Hence, it is quite reasonable to expect that AMPK controls the levels and activity of various cell surface proteins, perhaps through control of membrane traffic processes to ensure homeostasis and adaptation during metabolic stress conditions (Figure 4A). Figure 4-B. Metabolic stress and AMPK regulate cell surface protein membrane traffic. (4-B) AMPK activation (using the AMPK agonist A769662) decreases cell-surface levels of b1-integrin, as per (Ross et al. 2015, PLoS ONE). We recently published a mass spectrometry-based study that found that AMPK robustly regulates the cell surface content of many proteins, in particular of cell adhesion and migration proteins such as β1-integrin (Figure 4B, Ross et al. 2015, PLoS ONE ). 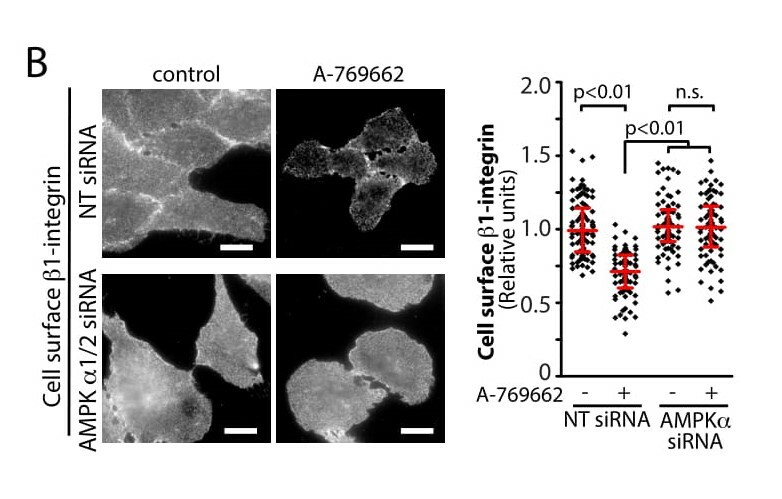 The control of membrane traffic of β1- integrin results in robust control of cell migration by AMPK. 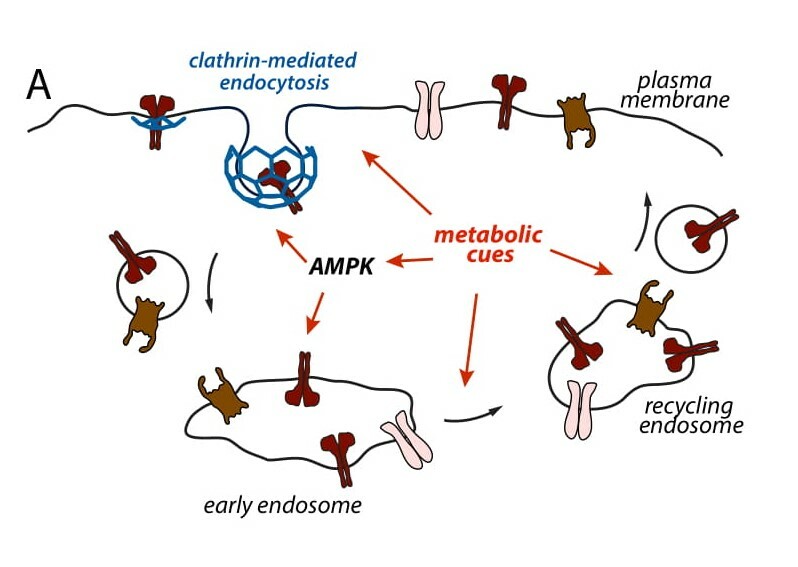 There remains much to be learned about the mechanism by which AMPK controls membrane traffic phenomena such as clathrin-mediated endocytosis. Moreover, it also not known how other metabolic sensors and cues may orthogonally to AMPK to control cell surface membrane traffic. In addition, the control of membrane traffic by metabolic cues not only controls the cell surface levels of specific proteins, but also controls the function of transcriptional circuits dependent on membrane-associated proteins. We have recently identified that mTORC1, another metabolic sensor activated by amino acid abundance and inactivated by AMPK, controls the nuclear translocation of glycogen synthase kinase 3β (GSK3β), thus impacting c-myc and snail-dependent transcriptional circuits (Bautista et al, BioRxiv, 2018) . Notably, GSK3β is localized to various endomembranes and regulation of GSK3β nuclear localization was highly dependent on membrane traffic. Hence, metabolic signals also control transcriptional circuits by regulating membrane traffic and thus membrane- associated transcriptional regulators. (iii) how this control of membrane traffic leads to control of transcription factors that dependent on endomembranes as signaling platforms. Phosphoinotides and membrane traffic: from inositol phosphorylation to acyl chain remodeling. The regulated phosphorylation of phosphatidylinositol (PI) gives rise to seven different species of phosphoinositide (PIP) lipids. PIPs are key regulators of membrane traffic and cellular signaling. PI and PIPs are unique among other phospholipids as they exhibit a remarkable specificity of acyl chains, such that 50-70% of PI/PIPs have an 18:0/20:4 acyl chain profile. Recent work indicated that the acyltransferase LYCAT regulates the incorporation of 18:0 into the sn-1 position of PIPs, and thus contributes to the acyl profile specificity of PIPs. We recently published work examining how the control of PIP acyl chains by LYCAT controls the levels, localization and function of specific PIPs (Bone et al. MBoC, 2017). We found that perturbation of LYCAT resulted in a reduction of the levels of specific PIPs, namely phosphatidylinositol-4,5- bisphosphate (PIP2) and phosphatidylinositol-3- phosphate (PI3P), but not others such as phosphatidylinositol-4- phosphate (PI4P). Importantly, cell biological processes dependent on PIP2 and PI3P, such as clathrin-mediated endocytosis and traffic to and from the early endosome, were disrupted in LYCAT silenced cells. In contrast, disruption of LYCAT did not impact biosynthetic membrane traffic, which is dependent on PI4P. Lastly, we observed that LYCAT localizes to a unique population of ER-derived vesicles that contain phosphatidylinositol synthase (PIS), suggesting that LYCAT and PIS functions may be coordinated during the generation of PI and certain PIPs to produce lipid species with enrichment of 18:0/20:4 acyl chain profiles during PI/PIP synthesis. We are currently focused on understanding how LYCAT controls the levels and localization of specific PIP species such as PIP2 and PI3P. Moreover, we aim to understand how the control of PIP species by LYCAT can impact growth, proliferation, survival and invasion in certain types of cancer cells. In particular, given the importance of mutations or other alterations that result in amplification of the PI3K signaling axis in many cancers, understanding how LYCAT controls the function of specific phosphoinositides could reveal new strategies to target specific cancer cells, which may be most relevant in PI3K-dependent cancers. Targeted drug delivery by therapeutic manipulation of endocytosis. To accomplish this, several strategies for targeted delivery of drugs to tumors have been developed. One such strategy is antibody-drug conjugates (ADCs), in which a cytotoxic drug is covalently linked to a therapeutic antibody, resulting in delivery of cytotoxic drugs to tumor cells with a particular marker. We are interested in developing strategies to enhance the delivery and internalization of ADCs into target cells in order to enhance specificity and efficiency of these treatments. We are also working to develop new approaches to achieve targeted delivery of systemically- administered drugs that are not targeted to tumors by virtue of molecular ligands. As we have recently published (Fekri et al, 2016, PLoS ONE) , we are working to develop methods using ultrasound to manipulate intrinsic mechanisms of endocytosis within cancer cells in order to achieve targeted and selective delivery of existing chemotherapeutic agents into cancer cells, and thus improve patient outcomes for treatment with these drugs.